This hotel is 100PCT Non-Smoking. 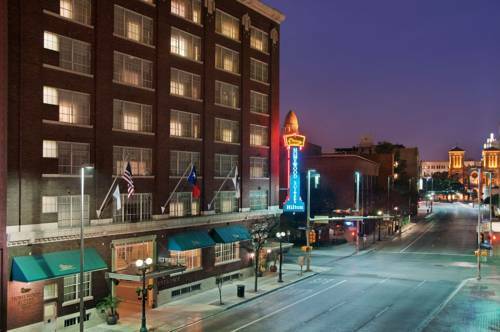 The Homewood Suites by Hilton San Antonio-Riverwalk/Downtown hotel is located in the heart of downtown San Antonio Texas directly on the famed Riverwalk. At this lovely Homewood Suites hotel you will enjoy one of 26 different suite plans that have been developed inside the San Antonio Drug Company building listed in the National Directory of Historic Places. The San Antonio Texas Riverwalk Downtown hotel offers one and two bedroom suites with fully-equipped kitchens. At the San Antonio Texas Riverwalk Downtown hotel you*ll enjoy our nightly Welcome Home reception each Monday through Thursday with two hours of complimentary frozen margaritas beer and wine - Texas hospitality at its best. The Homewood Suites San Antonio Texas Riverwalk Downtown hotel offers a Suite Start hot breakfast buffet served in our River Room with floor-to-ceiling windows overlooking the San Antonio River. Guests can unwind in our heated rooftop pool and whirlpool while enjoying a great view of downtown. At the Homewood Suites hotel you will also find a modern exercise facility a guest laundry executive business center and meeting facilities which can accommodate two to ninety people. Make Yourself At Home. All reservations must be guaranteed with a major credit card or adv cash deposit to hotel regardless of time of arrival. All reservations must be cancelled 24hrs prior to arrival unless deposit required. Policy subject to change. All rsv must be cancelled 24hrs prior to arrival host time unless deposit req. If this rsv has been made electronically please cancel it electronically to avoid confusion and a no-show bill. Policy subject to change. ~3 miles from San Antonio.